Hello everyone, welcome. 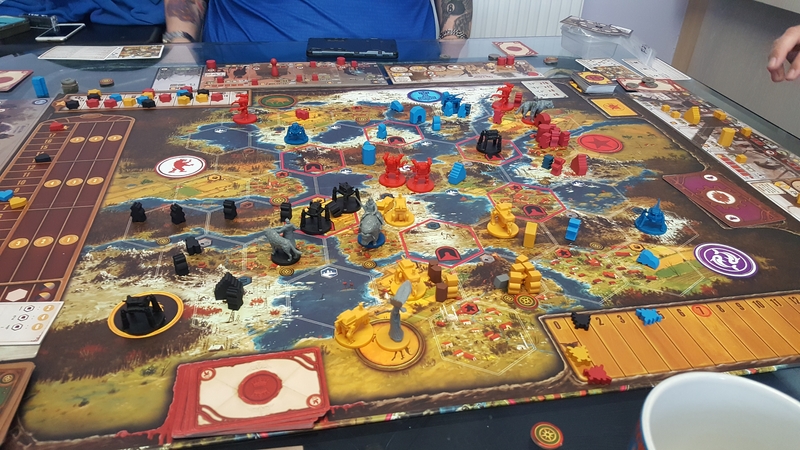 Today I am going to be writing up a game of Scythe I played recently as the Saxony Empire. As I was playing the Patriotic faction, when move is activated I get the option to spend 2 oil (no more or less) to upgrade one of my abilities (I suppose technically two abilities – doing an upgrade moves a cube from the top, revealing another green to, to the bottom, covering a red). I decided for the sake of efficiency my first action would be to pay to trade. This would allow me to buy 2 Oil, so that on my second turn when I moved, I would do the Move Action (Top Level action, far left of the board), I could then pay the cost of Two Oil to do an upgrade. I did this and moved my meeple to the village, my hero one space closer to the encounter and I upgraded my produce so that when I produce goods, I could do it on three tiles rather than two, and I moved the cube to Deploy to make my Mech’s Cheaper. I also got 1 gold for Upgrading as that is part of the Upgrade Process. I then produced to get more meeples and an Iron, then repeated the first couple of turns upgrading my move and deploy once more in the process. On my second move I obtained my one and only encounter of the game. I took 2 Food and 1 Popularity. The Saxony Empire Advantage is they can gain any number of Victory Stars by combat, however, I realised that regardless of strategy in obtaining victory stars I would need popularity as it acts as a victory point multiplier at the end. I also figured it would be a while before I could produce food so that was desirable. I have to say that my first quarter to third of the game I spent in my base, buying Oil, Breeding Meeples, Harvesting Iron and upgrading things. I split my upgrade efforts between Deploy (for mechs) and Enlist (Which uses food to recruit soldiers). Enlisting allows you to uncover a lower level ability that triggers every time you activate that ability. Awesomely, this also triggers when an adjacent player does it. I recruited the soldier from Build, which meant any time one of the adjacent players built a structure (or any time I did), I gained popularity. This paid off a lot. By the End of the first Third (roughly), I had all my meeples out. Three were on the tundra producing oil, three were on the village as I hadn’t moved them yet and two were on a mountain. I had 4 iron, and no Mechs. But that was about to change as my Mechs now cost one Iron to build. Actually, now that I think on it, I told a lie earlier. I actually got a second encounter card. At the beginning of the second third, I built my first mech and then used it to carry meeples from the village to the mountains, which were adjacent to where they were going. I moved my hero to the Forest with the encounter across the river and as fortune would have it, one of the encounters yielded oil which I used for further upgrading. Other players got their mechs and meeples out faster, but I was the upgrade King of this game. I repeated this sequence, of building a mech (this time on the Tundra with 3 meeples), and then moving. I moved my hero closer to the Factory at the centre of the board and sent my first Mech with three meeples to the Forest. It was then time to produce, which netted me a lot of Wood, Oil and Iron. Whilst the other players were all fighting over the factory and the encounters I rapidly built up my mech force and then seized the farm with a tunnel on it, as well as a second forest. By this point I was ready for the final third of the Game. I had territory. I had all my mechs and their abilities and having used the wood to build a Monument, I had significant popularity and combat strength. So, I surveyed my abilities. My Mechs could move from mountains to forest over rivers. They could move from mountain to tunnels (Unique ability). When they fought on a territory with a tunnel, they reduced the enemy combat strength by 2. And they had +1 speed enhancement. I piled mechs onto the farm with a tunnel, guarding the forest and then spent the next few turns alternating between building combat strength and popping out of tunnels all over the board like some kind of mechanised Land Sharks, defeating enemy mechs. I also managed to get my character into the factory and was the last player to get a factory card. I never used it. And I wasn’t able to hold it until the end of the game. In the final third of the game I achieved 2 combat victories in quick succession and this put me on 5 of 6 victory stars. I didn’t have as much territory as some, certainly Blue and Yellow were spreading out as much as they could and Red was doing the same but not to to the same extent. Red, the Rusviets, were also on 5 victory stars and they had more popularity than I did. They ended the game with their sixth star on the same turn as I was planning to. They kicked me out of the factory, spread out a bit and got their sixth star. It was all over except to count up the points. First place with 81 went to the Rusviets. Interestingly, the Rusviets made approximately 21 of their victory points in their last turn. So, if I had just managed to end the game a bit sooner it might have been a victory for Saxony. Despite not winning, the game was incredible fun, and all the better for being so close.